Beijing experienced more than 200 days of air pollution categorized as “unhealthy” or worse in 2014, including 21 days that were “hazardous” – while only about 10 days were considered “good,” according to data gathered by the U.S. Embassy in Beijing. This week, smog was so severe that authorities declared a “red alert” for the first time, closing down schools, halting construction and limiting car traffic. The alert came during a week when negotiators at the U.N. climate summit in Paris accused China of trying to weaken a global accord, and a month after a report that China has been burning up to 17% more coal a year than it previously disclosed. Environmental conditions in China have stoked worries among the public there about air pollution and whether the situation is likely to improve. But when it comes to the broader subject of climate change that is being discussed in Paris, the Chinese show less intensity in their concerns compared with people in many other nations. About three-quarters (76%) of people in China say air pollution is a big problem, including 35% who regard it as a very big problem, according to our spring 2015 global survey. About the same number of Chinese (75%) say water pollution is a very or moderately big problem, and of 15 issues tested, both rank among the public’s top concerns. More than a third (36%) of the public believes air pollution will improve over the next five years. But 34% of Chinese expect the situation to worsen and 22% say it will remain the same over that time period. Chinese living in Beijing and Shanghai, the country’s two largest cities, are the most pessimistic of those polled: 53% believe air pollution will worsen in the next five years. In March, a documentary about air pollution entitled “Under the Dome” went viral in China, drawing more than 150 million viewers on video sites like Youku in less than a week. China’s minister of environmental protection, Chen Jining, referred to the phenomena as the nation’s “Silent Spring” moment (when a book rallied the U.S. public to push for pesticide limits). However, the Communist Party pulled the video offline shortly afterward. Both the video and the U.S. Embassy data focus on PM2.5 (particulate matter with diameters of 2.5 micrometers or less), which are found in smog and acid rain and originate from coal plants, diesel trucks, dust from construction sites, and other sources. These tiny pollutants are among the most dangerous, as they can embed in lungs and enter the bloodstream, leading to heart and respiratory problems, according to the U.S. Environmental Protection Agency. Despite widespread concern about air pollution, the Chinese are less intensely worried about the broader issue of climate change than people in many other nations. Three-quarters of people in China, the world’s top polluter, say climate change is at least a somewhat serious problem, but just 18% say it’s a “very serious” problem – a decline of 23 percentage points since 2010, and much lower than the 54% median in 40 countries surveyed who say the same. 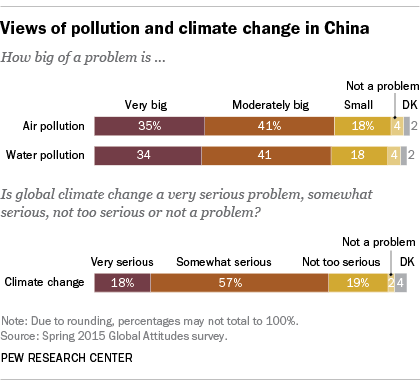 Another 73% of Chinese are at least somewhat concerned that climate change will harm them personally, but again, just 15% say they are “very concerned” – compared with a 40% global median who are very concerned. To address the issue, 56% of people in China believe rich countries should do more than developing countries because they have produced most of the emissions so far, compared with 33% who say developing countries should do just as much because they will emit the most in the future. Overall, a broad majority (71%) of Chinese support an international deal limiting greenhouse gas emissions, roughly in line with the 78% global median who agree. 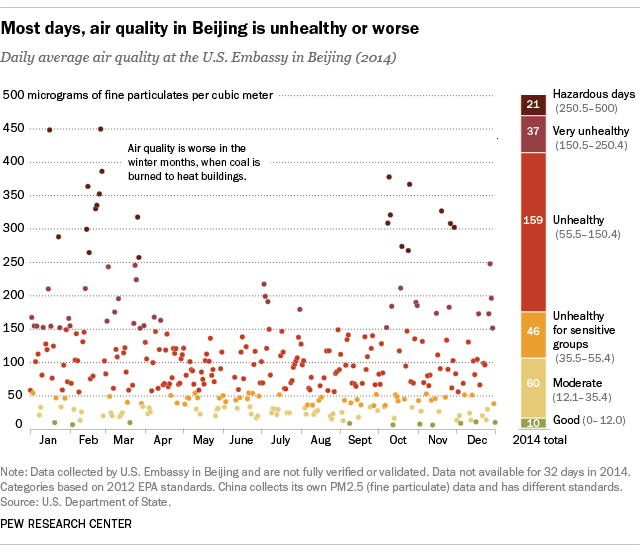 Note: The data for air quality at the U.S. Embassy in Beijing refer to categories based on U.S. EPA standards. China collects its own PM2.5 data and has different standards.